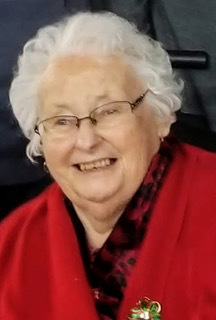 Peacefully with family by her side at the Dundas Manor on Tuesday, April 9, 2019, age 85. Beloved wife of the late Stanley Wadmore Marriner. Daughter of the late Lucy (Brown) and Lytelle Crowder. Loving and dearly loved mother of David (Nancy), Leonard (Debbie), Perry (Wilda), the late Greg, Peter (Laurie), and Anne Gibson (Chris). Cherished grandma of Trisha (Andre), Kristen (Martin), Shana (Justin), Mandy, Jesse (Susan), Ryan (Tristan), Daniel (Ginny), Reise, Laura (Ryan), Natalie (Matthew), Paul (Montana), and Patrick. Dearest great grandma to Isabelle, Nathan, Olivia, Peyton, Rosalie, Stanley, Owen, and Hudson. Laura was predeceased by her sister Marguerite Henry (late Raymond) and brothers Garfield (Irene) and Lawson. She will be sadly missed by many nieces, nephews, and friends. At Laura’s request, there will be a private family graveside service at Maple Ridge Cemetery. Donations in memory of Laura may be made to the Dundas Manor Activity Fund. Sorry for your loss! May the memories you have get you through this difficult time. Sorry to hear of your loss and know that we are thinking of you at this sad time. I have many great memories of Aunt Laura. I remember especially Elementary School days going for lunch at her place and she always served a great meal.